Do you ever find yourself in the mood for chocolate cake but can't justify baking an entire cake just for yourself? Or perhaps you're short on time? What would you say if I told you that you can have a single-serving of chocolate cake literally three minutes from now with virtually no cleanup required? I have not one but three recipes for you today. 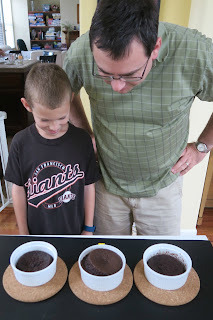 You may recall that I did a blog series of mug meals while Steve and Trevor were away at Cub Scout Camp. I tested a variety of recipes and can highly recommend Pizza in a Mug, Omelet in a Mug, Oatmeal in a Mug, and Chocolate Chip Cookie in a Mug. Time to explore the wide world of cakes in a mug. First, a note about mugs. They come in many sizes. Most recipes assume you're using a large mug in the 14-16 oz. range. If you do not have a large, microwave-safe mug, do yourself a favor and use a ramekin or a bowl instead. Trust me. There are many, many recipes for mug cakes online, but after reading through several dozen, I realized there were two basic categories: from scratch and using cake mix. In general, I like baking from scratch, but the point of a mug meal is that it's quick and easy. Measuring a dozen ingredients is not quick and easy, so I skipped those to concentrate on the ones that use cake mix. 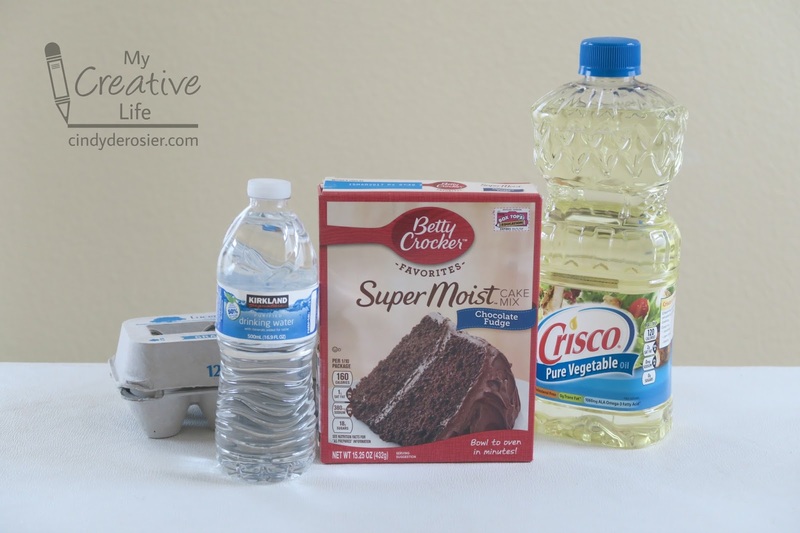 All the recipes I found contained cake mix, oil and water in some proportion. Many, but not all, included egg. 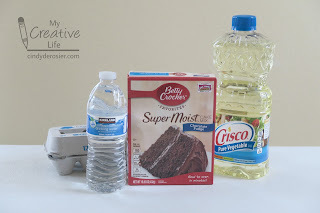 I realized that most of the recipes called for cake mix and liquid in equal proportions. Most ranged from 6 tablespoons each of cake mix and various liquids up to 8 tablespoons (1/2 cup) of each. I split the difference and went with 7 tablespoons each of cake mix and liquids. I also decided to stick with 1 T. of oil, since that was fairly standard and easy to measure. With my basic plan in place, I looked at the variables next. The major one was the presence or absence of egg. I decided I'd make one version with no egg, one with one egg, and one with half an egg. After learning that an egg is equal to 4 tablespoons, I was able to calculate how much water to add to each recipe to bring it up to the 7 tablespoon level. You may be wondering why I would test out a cake with half an egg, as it is a real pain to whisk an egg and then divide it in half. The main reason is curiosity. If you scale down the instructions on the Betty Crocker cake mix, that's the closest to what the proportion would be. I assumed that adding half an egg would yield the cake most similar to what the box mix would make following the directions properly. 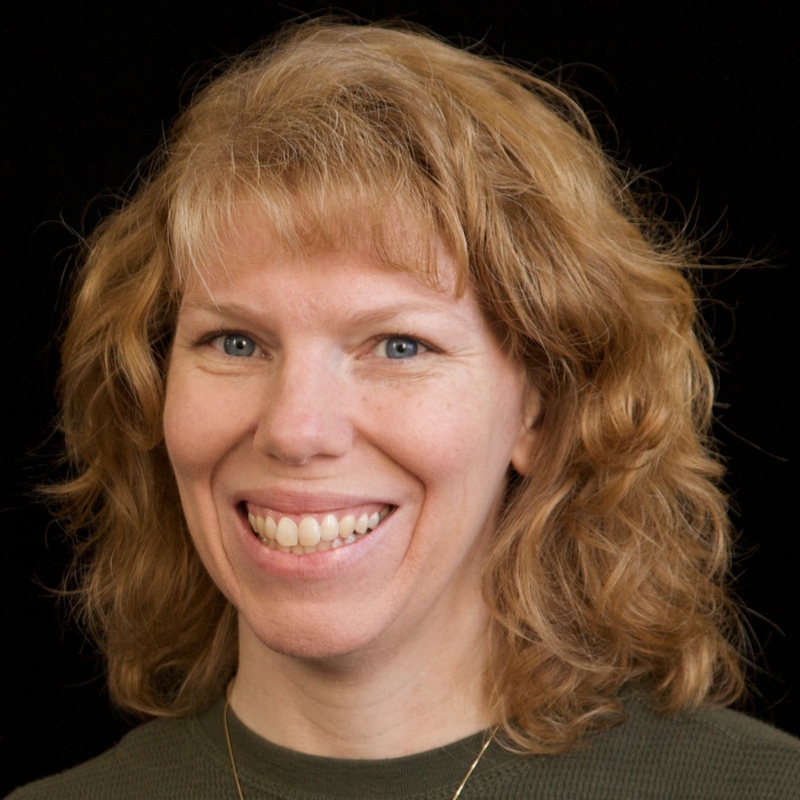 There were some major differences that were immediately apparent. Cake A (the one without egg) did not rise. It baked up the darkest and the moistest. 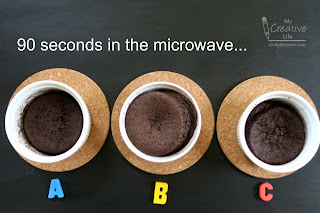 Both Cake B and Cake C rose well above the height of the ramekin in the microwave. However, Cake C collapsed midway through cooking and ended up almost as low as A. Cake B held its structure out of the microwave before sinking a bit as it cooled. 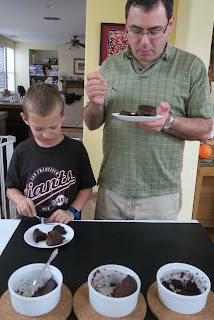 I called in two eager taste-testers to examine the cakes. They both felt that Cake B looked correct and that the other two did not. They were especially suspicious of Cake C. I cut slices from each cake and they tasted them. Look at Trevor's face. He's reacting to Cake C, which he HATED. A (no eggs): This cake was the darkest and had the strongest chocolate flavor. It was both crumbly and creamy. It was very soft and reminded Steve of pudding. B (one egg): This cake had the least amount of chocolate taste. It looked and felt the most similar to ordinary chocolate cake, but the texture was a bit too bouncy and more bread-like than cake usually is. It had large air pockets throughout the cake. C (half an egg): This cake was oddly solid and didn't crumble like cake. The texture was OK, but a bit more like a souffle than cake. The chocolate flavor wasn't strong enough, but it was more pronounced than B. So which cake do we recommend? Trevor ranked them A-B-C. Steve ranked them B-A-C. I ranked them C-A-B. So three totally different opinions! I suspect if I'd frosted them, served them with ice cream, dusted them with powdered sugar, or topped them with a raspberry coulis, our votes would have changed. Each would be complimented by something different. 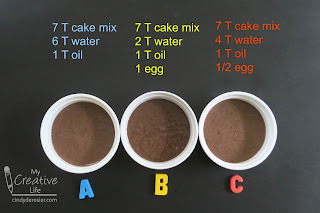 Even though it was my favorite, Cake C is not going to be my go-to microwave cake because measuring half an egg is a nuisance. For a straight-out-of-the-mug, quick chocolate-fix, I'd recommend Cake A. For a more traditional cake experience, choose B... but top it with frosting, chocolate chips, or chocolate ice cream to boost the flavor. You really can't go wrong. And I am still sitting here wondering, 'how the heck do you do 1/2 an egg?'!!! LOL!! I love this experiment!!!!!!!!!!!!!! LOL To Julie's comment because I was thinking the same and automatically though that Cake "C" would be a P.I.T.A! 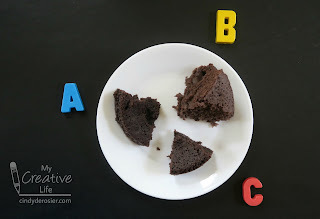 As someone who counts calories I was leaning towards cake "A" and it sounds like it is a good choice taste-wise as well!